Source: I received this book from the publisher in exchange for an honest review. Thank you, Iris and Pegasus! When Caleb Wardell, the infamous ‘Chicago Sniper’, escapes from death row two weeks before his execution, the FBI calls on the services of Carter Blake, a man with certain specialized talents whose skills lie in finding those who don’t want to be found. A man to whom Wardell is no stranger. The Killing Season is a strong and impressive debut from author Mason Cross. This action-packed and well-written thriller is a manhunt for the notorious serial killer sniper Caleb Wardell. Wardell (the “Chicago Sniper”) killed nineteen people and is just weeks away from his execution when he escapes and begins another killing spree. The FBI brings on outside specialist Carter Blake, who has an uncanny ability to find those who do not wish to be found. Blake’s backstory is only hinted at, but he’s a compelling main character with brains and spot-on intuition. He’s working with the Bureau, not for it, so he has a lot of freedom to operate how he wants. Over the course of six days, Blake works with Agent Elaine Banner to track down Wardell. Banner is a single mom with ambitious career goals. She hopes that by catching Wardell she’ll earn a promotion. However, as the story progresses, she starts to trust Blake’s intuition and is torn between following protocol or going against the rules. She doesn’t have the ability to go off on instinct or hunch alone like Blake does, so by ignoring or disobeying orders she could jeopardize her career. I really liked Agent Banner. I think she was my favorite character, but Agent Steve Castle really grew on me (like, really grew on me), and I even found Caleb Wardell and his narrative to be fascinating, if disturbing. The book jumps from viewpoint to viewpoint. Blake’s chapters are told in first person, and Banner and Wardell’s in third person. At first it took some getting used to the changes in narration, but I actually ended up liking the switching POVs. It made things interesting and gave different perspectives of shared experiences. Have you read The Killing Season? If you haven’t, would you be interested to? What was the last thriller you read? What’s a favorite thriller you’ve read? Comment below letting me know! And, as always, happy reading! Ohhhhhhhhh my gosssshhhh this sounds AMAZING! I’m so glad you like it! 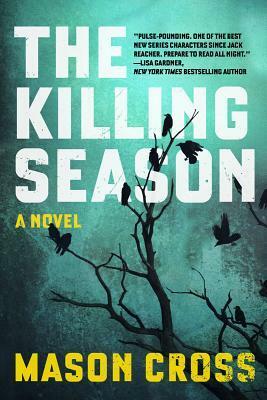 I’ve never heard of The Killing Season before (at least I don’t think I have O.o) but I should so read it now!